Up and at ‘em...day two of the delegation kicks off with breakfast, then meetings with, uh, somebody about solar, I think. After a quick shower, I headed down for breakfast. We met as a group, then walked into the attached building next door to the guest house, where we headed upstairs to a private room with a large round table. Here, we met the president of Best Solar. Since I’ve had very limited exposure to solar, I wasn’t familiar with Best, but by the end of the day, I certainly would be--these guys have been on a fast track. Dr. Fang has grown the company an immense amount in its short lifespan...generating numbers which would make most VCs salivate, although it’s tough to determine exactly how much private capital was invested up front, how much government support was received, when they’ll be profitable, etc. Regardless, the Best Solar team seems to be doing a TON of stuff right. Breakfast was enormous. Tasty, but enormous. Note to self: contemplate eating no more than two Egg McMuffins’ worth tomorrow morning...although converting Chinese breakfast banquet helpings into McDonald’s helpings might be challenging. Afterwards, we headed downstairs and on to the bus--this one smaller than last night’s, and hopefully less bouncy. The ride from Shanghai had contained nearly as much up and down as forward, so much so that a screw rattled out of the bottom of my HackBook. For those of you who’ve thought for years that I had a screw loose, you’re almost right--it’s not loose, it’s missing. By light of day, the guest house is a non-descript building which you likely wouldn’t recognize as a lodging facility. Then again, maybe there was a huge sign written in Chinese, but I certainly didn’t see one...and if I did, I sure wouldn’t know what it said. 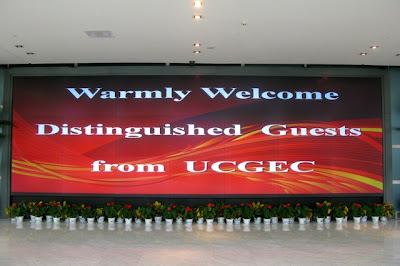 As we pulled away from the guest house, one of our government hosts began a narrative of what we were seeing as we drove around the Suzhou Wuzhong Economic Development Zone (SWEDZ) International Education Park. I can describe the park as nothing short of stupendous. Picture an industrial park consisting of more than a dozen new sites spread out in extended campus-like fashion, each site housing a different educational institution--14 universities and institutes in all, with thousands of students enrolled at each one. 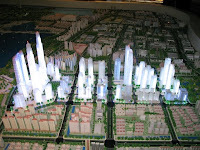 We ended the bus ride at the SWEDZ building, where we toured their showroom, viewing the largest model city I’ve ever seen in my life. As a kid who spent much of my childhood building stuff with Tinker Toys and Lincoln Logs, I had some very serious envy. Resisting the urge to jump the barrier to do my best Godzilla impersonation was tough, too, but I managed. The presenter did a solid job delivering her pitch in English, as well as answering our questions. At the conclusion of our tour, we hopped into an elevator and headed up, stepping out into the Best Solar headquarters office. We spent about 90 minutes with Dr. Fang and his staff, learning more about Best and exploring opportunities for UCGEC members to partner with Best on projects. We also toured one of their brand new factory floors, which was absolutely spotless. From there we headed to lunch, which I wasn’t really looking forward to (if you can believe that), as I was still working on digesting my huge breakfast. After hopping back on the bus for the short ride back to the guest house, we passed a ton of new construction, both commercial and residential. The architecture of the commercial buildings in SWEDZ is impressive--somebody’s earning their design fees. 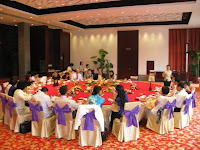 Back at the guest house, we were ushered into a large banquet room which had the largest round table I’ve ever seen. On our way out from breakfast, I’d commented to Jiong Ma that they were setting up a stage for him to dance on. Lo and behold, that was our lunch table. We enjoyed our second delicious but massive meal of the day, before running back to our rooms to grab our bags and hop on the big bouncy bus for the ride to...uh...wherever. I’d heard we were going to Suzhou, but I thought we were already in Suzhou. Whatever...onto the bus we went. Less than a half-hour later, we pulled into the Grand Metro Park Hotel Suzhou--a five-star hotel. I joked that since there was no way that the accommodations could be this great every night of the trip, that the trip should’ve been organized with the Grand Metro Park and the SWEDZ guest house as the final two nights, rather than the first two nights. Talk about setting the bar high! We had just enough time to drop our bags in our rooms, then hop back on the bus for the ride to the China-Singapore Suzhou Industrial Park (SIP). Sadly, the term “industrial park” as we think of it in the U.S. can’t even begin to do justice to SIP. Think of an extremely successful brand new city built from the ground up over the last 15 years, and you’ll begin to understand SIP. 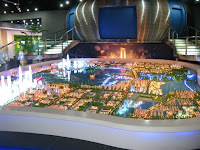 As we had at SWEDZ, we began with a narrative walk-through of the showcase displays, including a scale model of the park. This type of dog and pony show must be common here; the closest comparison I can make to the U.S. is the executive briefing center concept, the difference here being that they’re not selling widgets, they’re selling investment. And wow, what investment SIP has enjoyed--more than 12,000 companies are located there, more than 3,000 of which are foreign-owned. Average annual economic growth has been 30%, paid the equivalent of nearly $15 billion in taxes, and enjoyed foreign investment of nearly $16 billion. Guess what we did next? On to the bus, then a huge meal. Holy crap...if this keeps up, I might not make the end of the week, much less the end of the trip. At dinner, our places were set similarly to how they’d been at lunch, with three glasses of various sizes. At lunch, the wait staff immediately removed all but the middle-sized goblet as soon as we sat down. At dinner, all three glasses remained, and were used--the small, cordial-sized one for a splash of red wine (maybe a quarter of an ounce...a third of an ounce, tops); the small goblet for water or cold tea; and the large goblet for juice or soft drinks. When our hosts welcomed us with a brief speech, we toasted with the cordial glasses, downing our wee amount of wine in a single shot. The challenge here is that a cordial glass isn’t nearly large enough to enjoy any of the wine’s bouquet. The great news is that the very attentive waitresses were there to fill up my wine glass each time I emptied it; being able to empty the glass with a single sip made for frequent refills. The waitresses who’d drawn wine duty were always ready to pounce whenever anyone emptied their glass. I felt a little bit like walking through a crowded parking lot with my keys in my hand, with an eager driver matching their speed to my walking pace in hopes of landing a coveted parking spot. I slow down, they slow down. I speed up, they speed up. So too was it with the wine refill process. I got to the point that I’d pick up my glass as if to empty it (which, again, only took a single sip), then pause just as the waitress had engaged first gear to rush to refill my glass. Wait, second gear. They don’t use first here.